A 17th century, three storey mansion is an unexpected sight at the end of a welsh farm track. The rural views from the property appear timeless however the house, surrounded by a ‘sea of gravel’ currently feels exposed and disconnected from the landscape. 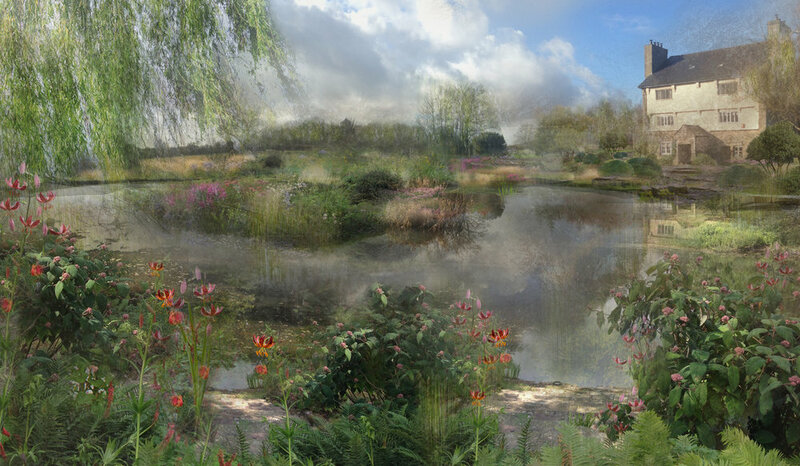 This design focusses on creating links between the house and garden and the garden and the rolling landscape beyond. The material palette will be simple; locally reclaimed Flagstones, cobbles and self-bound gravel. These will be arranged in patterns that influence how people move through and experience the space: Cobblestones will change direction to announce a doorway, side entrance or steps: Large paving stones - occasionally interspersed with planting - will denote places to pause, sit and relax. The use of local stone will give the garden a timeless feel and will ground it in its locality. 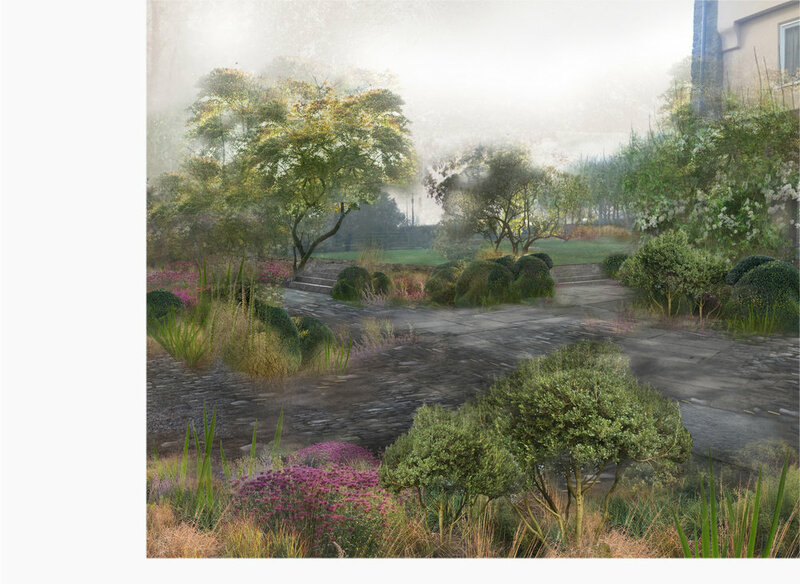 There will be a constant overlapping of different plant communities; swathes of naturalistic perennials will blend into marginal pool side plantings; woodland edge plantings will evolve into sunny meadow communities which will run directly up to green fields, blurring the boundaries between the garden and landscape. Shrubs and trees will be clipped to form asymmetric but balanced forms while others may have looser outlines. These compositions will also - occasionally - punctuate the meadow plantings, visually uniting the different areas of the garden. Groupings of different trees, shrubs and perennials will create thresholds, transitions and different seasonal pictures.